I have read that the .NET framework has great features to localize your application. I had to use them recently to create an English, Dutch, French and German "version" of one of my applications. I found out they worked well but it was very time consuming to set all the text properties of all controls for each language. Even worse you have to translate common terms like: OK, Cancel, New, Open, Close, etc. on every form if you want to use the designer. You can, of course, write code to fetch them all from one resource file. But I don't like to write code, especially if you don't have to. I came up with a solution for this problem, called the LocalizedTextProvider component. This component is actually an extender which, adds a LocalizedText property to a Control or MenuItem. When you add this component to a WinForm it will allow you to set the LocalizedText property ('Misc' category) of all controls on your form. You can select a Key from a predefined list. This list contains all keys from the string resources in the component. I have filled the list using the International Word List from the 'Microsoft Official Guidelines for User Interface Developers and Designers' website. The Text for the Cancel button will automatically be translated to 'Annuleren' for Dutch users, 'Abbrechen' for German users and 'Annuler' for French users. You can test this by setting the CurrentUICulture property of the CurrentThread to a Dutch, German or French CultureInfo. 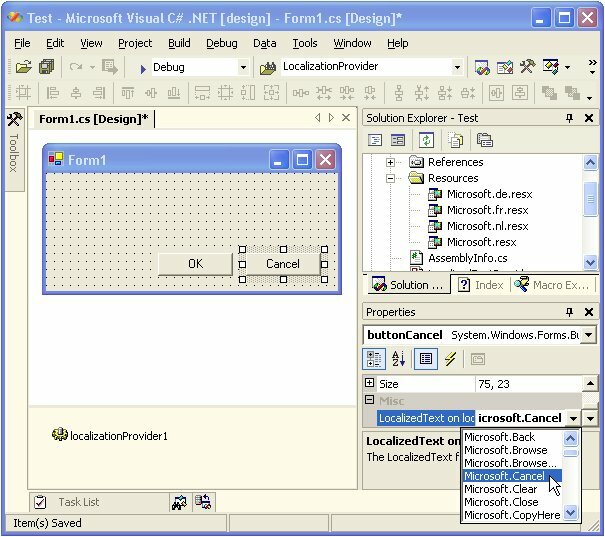 The LocalizedTextProvider class is derived from System.ComponentModel.Component and implements the System.ComponentModel.IExtenderProvider interface. This makes it an extender. The ProvideProperty attribute on the class specifies the name of the property (LocalizedText) that it offers to other components. The CanExtend method specifies whether this object can provide its extender properties to the specified object. In this case a Control or MenuItem. The GetLocalizedText() and SetLocalizedText() methods retrieve and store the resource key into a Hashtable. The UpdateText() method uses this key to retrieve the string from the resource file. /// Specifies whether this object can provide its extender properties to the specified object. The GetLocalizedText() method has a Editor attribute which specifies the LocalizedTextEditor used to change a property. The LocalizedTextEditor class is derived from PeterBlum.UITypeEditorClasses.BaseDropDownListTypeEditor. This base class makes it very easy to create your own editor. You only have to override the method FillInList() and fill the listbox. I have downloaded it from Peter's website, thanks Peter. Localization isn't hard but it is a lot of work. I hope my LocalizedTextProvider component makes it easier for you. You will probably have to extend the resource files with extra keys and or languages. Have a try.